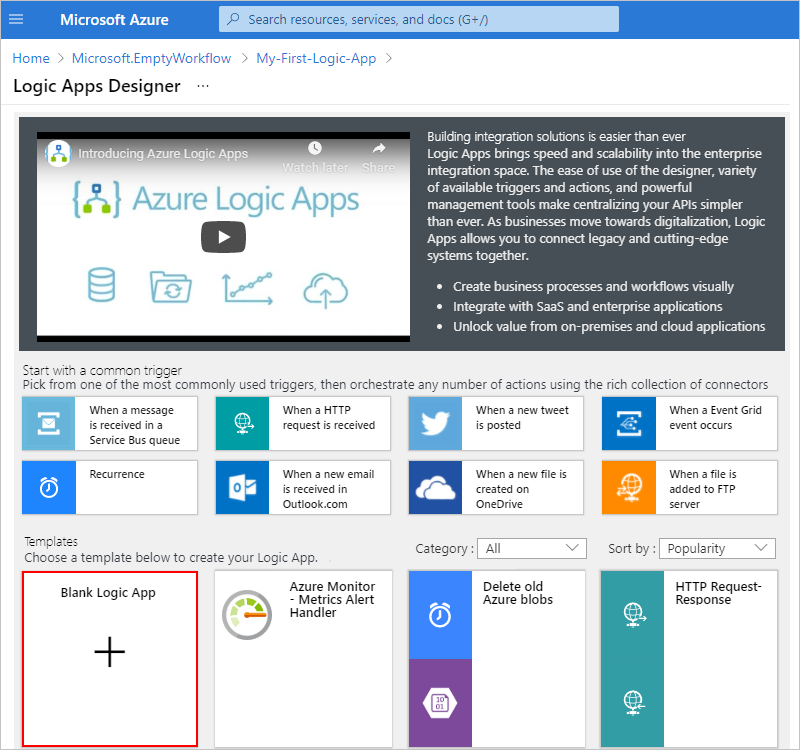 From the main Azure menu, choose Create a resource > Integration > Logic App. Under Create logic app, provide details about your logic app as shown here. After you're done, choose Create. Next, add a trigger that fires when a new RSS feed item appears. Every logic app must start with a trigger, which fires when a specific event happens or when a specific condition is met. Each time the trigger fires, the Logic Apps engine creates a logic app instance that starts and runs your workflow. Together, the interval and frequency define the schedule for your logic app's trigger. This logic app checks the feed every minute. To hide the trigger details for now, click inside the trigger's title bar. Your logic app is now live but doesn't do anything other than check the RSS feed. So, add an action that responds when the trigger fires. Now add an action that sends email when a new item appears in the RSS feed. Under the When a feed item is published trigger, choose New step. Under Choose an action, enter "send an email" in the search box. Under the search box, choose All. 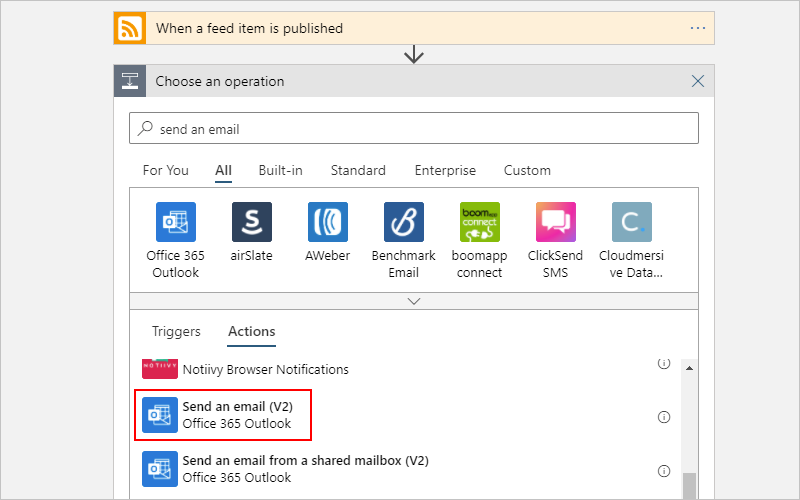 From the actions list, select the "send an email" action for the email provider that you want. 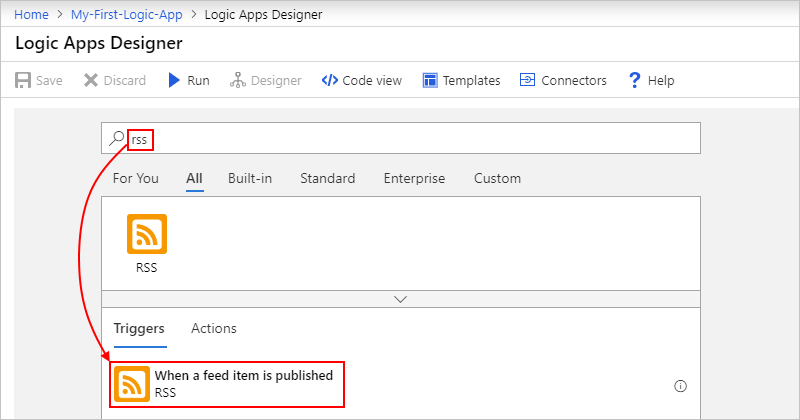 If asked for credentials, sign in to your email account so that Logic Apps creates a connection to your email account. In the To box, enter the recipient's email address. For testing purposes, you can use your own email address. For now, ignore the Add dynamic content list that appears. When you click inside some edit boxes, this list appears and shows any available parameters from the previous step that you can include as inputs in your workflow. 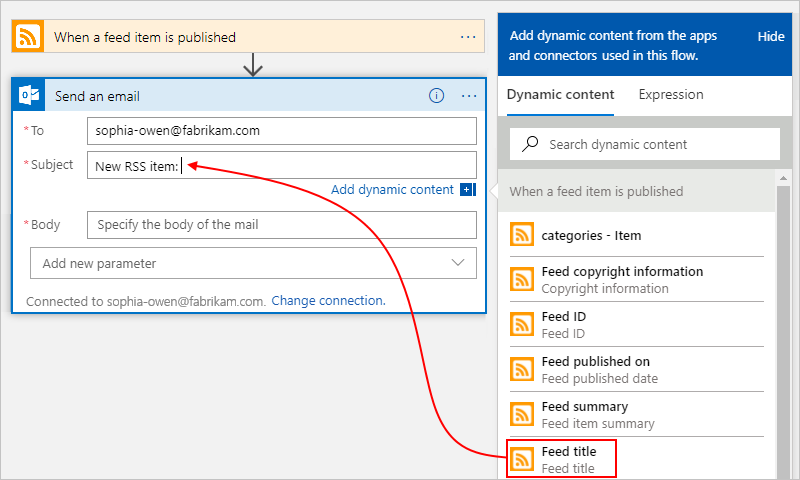 From the Add dynamic content list, select Feed title to include the RSS item title. If a "For each" loop appears on the designer, then you selected a token for an array, for example, the categories-Item token. For these kinds of tokens, the designer automatically adds this loop around the action that references that token. That way, your logic app performs the same action on each array item. To remove the loop, choose the ellipses (...) on the loop's title bar, then choose Delete. In the Body box, enter this text, and select these tokens for the email body. To add blank lines in an edit box, press Shift + Enter. Next, test your logic app. To manually start your logic app, on the designer toolbar bar, choose Run. Or, wait for your logic app to check the RSS feed based on your specified schedule (every minute). If the RSS feed has new items, your logic app sends an email for each new item. Otherwise, your logic app waits until the next interval before checking again. For example, here is a sample email that this logic app sends. If you don't get any emails, check your junk email folder. 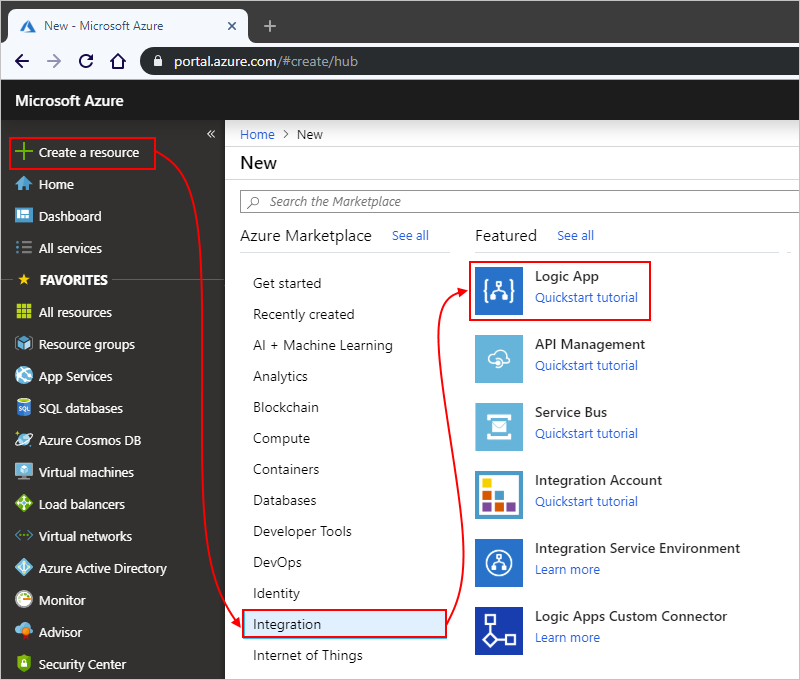 Congratulations, you've now successfully built and run your first logic app with the Azure portal! 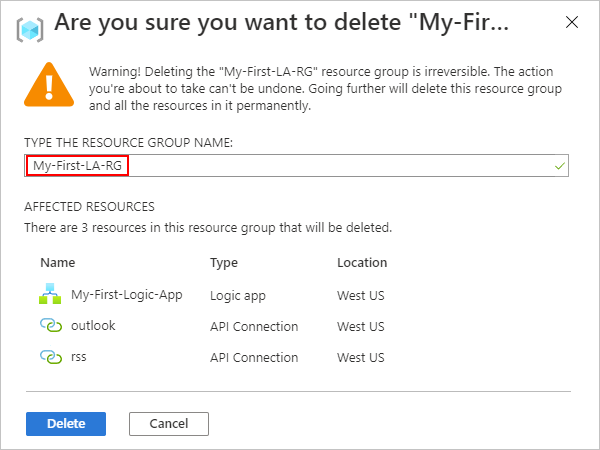 When you no longer need this sample, delete the resource group that contains your logic app and related resources. 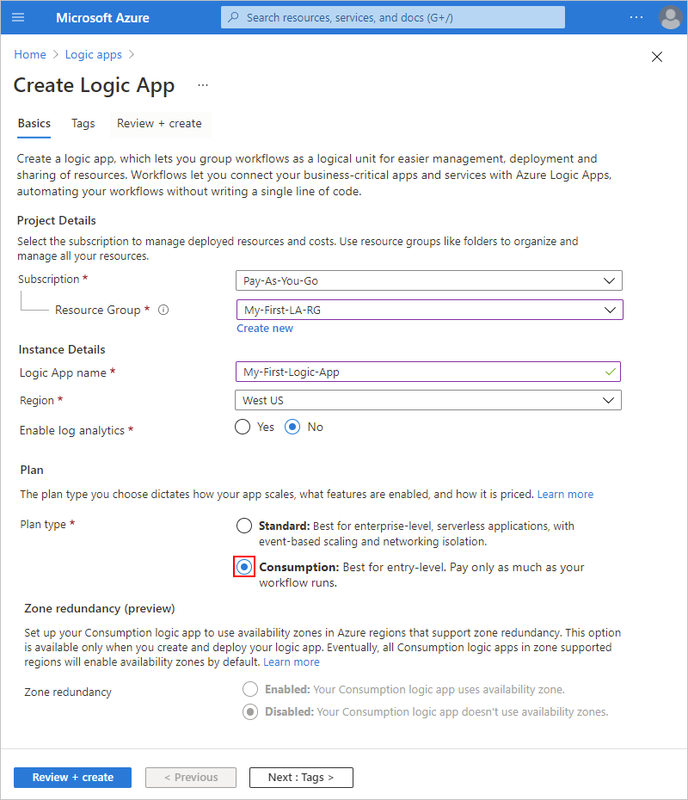 On the main Azure menu, go to Resource groups, and select your logic app's resource group. On the Overview page, choose Delete resource group. Enter the resource group name as confirmation, and choose Delete. When you delete a logic app, no new runs are instantiated. All in-progress and pending runs are canceled. If you have thousands of runs, cancellation might take significant time to complete.